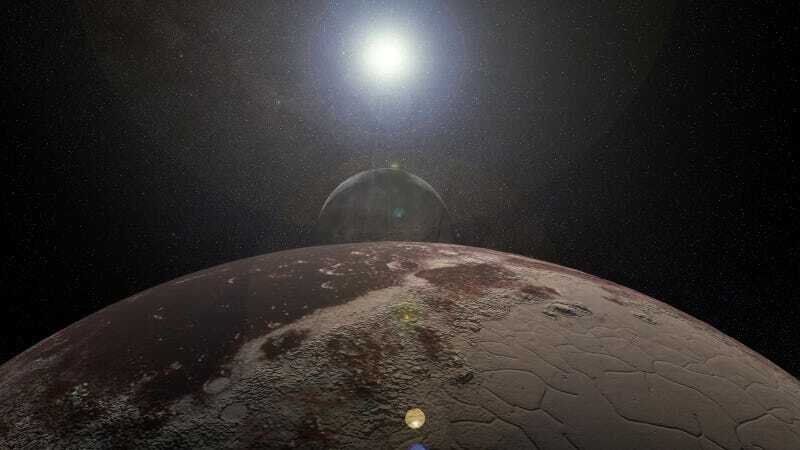 Artist’s rendering of the Pluto-Charon dwarf planet system, which is not quite a system where moons have moons. So she went hunting for an answer. As far as scientists can tell, none of the Solar System’s planets have submoons, moons orbiting their moons. Kollmeier from the Observatories of the Carnegie Institution of Washington and astronomer Sean Raymond from the University of Bordeaux teamed up to find that the answer is, well, complicated. But in the wake of an enormous exomoon possibly spotted around another star, the question is as prescient as ever—and might reveal important information about the history of our own Solar System. “We’re really just scratching the surface here with how we can use the absence of submoons to figure out our early history,” Kollmeier told Gizmodo. A plot from the paper shows that the Moon could have had a stable submoon—black circles represent moons, and the grey regions represent parameter where the moons could have their own moons. The team’s short analysis found that small submoons, perhaps 10 kilometers in radius, could only survive around large moons (such as the ones we see in our Solar System) far away from the host planet, according to the paper published on the arXiv preprint server. Moons that are too close to their host planets or too small might lose their submoons to tidal forces from the planet—shredding the submoon up, sending it crashing into the moon or planet, or shooting it out into space. But even though the Solar System doesn’t have known submoons, there are some moons that could once have had submoons, based on their size, according to the analysis. That includes Earth’s own Moon. Though Kollmeier has thought about the question since 2014, recent news of evidence for an exomoon (meaning a moon in another star system) reenergized her and Raymond to get the paper out. Scientists using Hubble recently observed something tantalizing: A few hours after the massive exoplanet Kepler-1625b passes in front of its host star, the star’s light seems to dim a second time. Astronomers thought that a moon the size of Neptune might be orbiting the 10-Jupiter-mass planet and causing the second dimming. Given the enormous size of that potential exomoon, it could be a good candidate for having a moon of its own: a submoon. Astrophysicist Michele Bannister from the Queen’s University Belfast in Northern Ireland thought the question of whether a moon can its own moon was intriguing. She pointed out that there are already some very strange systems of celestial bodies beyond Neptune that challenge our definition of a “moon.” Charon doesn’t orbit Pluto, for example, but in fact both objects orbit some point located between them, with four other small moons also orbiting that point. Similarly, the 47171 Lempo system contains two minor planets orbited by a third, much smaller satellite. Still, the paper hasn’t been peer reviewed by other scientists yet, and there’s work left to be done. Bannister would like to see a more in-depth analysis using higher-resolution data on how mass is distributed inside the Earth and Moon, for example—without more precise calculations, we won’t be able to determine whether our own Moon could have ever had a companion of its own.